Here's a picture of our set up at Busy Hands. We took three of our five shelves. It was still lots of room. This is the video I took of my honey man catching a swarm of bees wearing only shorts and a T-shirt. That's my cousin Randy helping out. This was summer 2008. 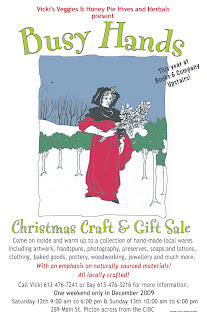 Tomorrow we have our last craft sale of the year and it's in our hometown of Picton! Vicki and I have been doing this sale for years and it's always a great time and well attended. I drew the picture for this poster - copied from an old magazine cover I found once. We took the green cabinets we made for the One of a Kind so they could have another outing. They're too pretty to leave at home all the time. I guess we'll have to get out our town clothes too so we don't look too shabby next to them. Everything is set up and looks beautiful. I'll post pictures soon. Well, we survived the One of a Kind Show! We did the first five days since it was our first time doing the Christmas show. The whole show is eleven days and we'll definitely go for the whole show next year. It was fun dressing up and taking our farm kitchen to the city. We were at Vicki's Veggies heirloom tomato tasting this Sept. selling our wares and tasting all the beautiful tomatoes. The tomatoes were sliced on their own plates with sweet little name tags on signs. On our table - a nice display of the lavender honey. We always love the tomato tasting at Vicki's and have been selling our products there for several years. It's always on the Labour Day weekend. We recently did a craft sale in Toronto at the CBC building. We had a really great time and were dressed up in our best going to town clothes. Rick Mercer was presiding over us in a slightly scary way. People were loving our lavender honey. We put some hives on the Prince Edward County Lavender Farm this summer and the bees happily harvested nectar from the lavender blossoms. The honey has a light delicate flavour but doesn't taste like lavender. Nial Eccles drew this amazing colouring sheet of us for Buddha Dog in Picton. They give out these colouring sheets to kids who visit their local gourmet hot dog shop. The people who supply the produce, meat, bread etc. 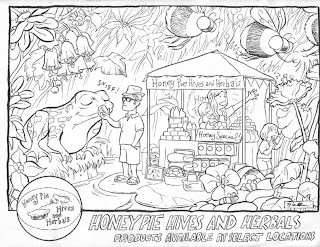 used in their hot dogs and toppings are featured in the colouring sheets. We have been supplying honey for their fruit smoothies this summer. We love the way Nial captured our booth and our whole family. Thanks Nial!!! We have spent a lot of time building frames for our bee hives this year. This is a picture of me and my son Rowan working together. He's peeling the protective paper off of the beeswax foundation and I am using a tool to melt the beeswax onto the wires of the frame. We like to work outside under a shade tent. Here are some photos of wildcrafting St. John's Wort. We harvest the flowers and steep them in organic sunflower oil for 6-8 weeks in the sun to make our Aches and Pains muscle rub. These wildflowers grow in our fields and along treelines. I've been known to suddenly pull over to the side of the road when I see an especially big patch of St. John's Wort growing - only on a quiet country road. These yellow flowers turn the oil (and my fingers) bright red. This is the beginning of our blog! I have to go pick St. John's Wort now. More later.